The suspension of Derek Conway MP from the House of Commons has prompted the parliamentary commission to remind politicians that they should always publicly declare when they employ relatives. A friend emails me to say how fine the register of members’ interests is down at the National Assembly. The recently-updated record notes that Tory William Graham (South Wales East) employs his son as an assistant researcher, while North Wales colleague Mark Isherwood’s wife is one of his constituency assistants (5 hours a week). Conservative Andrew R.T. Davies (South Wales Central) employs his other half on a part-time basis as part of his Assembly support staff. Labour’s Janice Gregory (Ogmore) employs her husband part-time to do some admin, and the partner of John Griffiths (Newport East) also does some part-time administrative support. The spouse of Plaid Cymru’s Jocelyn Davies (South Wales East) is a part-time assistant at her constituency office. Here’s a great snap. It shows a road traffic accident from almost 90 years ago. Even with so little traffic on the road in those days, this crash was certainly unusual enough to be marked and turned into a postcard. 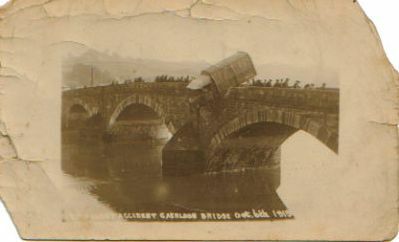 The card is captioned “Army (I think) Lorry Accident Caerleon Bridge, October 6, 1919″. It was given to me before Christmas by Mrs Margaret Rumsey, of Abergavenny. By the way the people are casually crossing the bridge, it appears the lorry must have been suspended in that strange position for sometime. Any Caerleon historians out there? Sadly, it seems the residents of Llantrisant, who fought hard to save their post office, have lost their battle. The official announcement is due tomorrow. There have been rumours about the housing of asylum seekers at Cardiff Prison. South Wales Anarchists Gagged! Newsletter and Respectable Citizen have both reported claims that the jail has again been used to make up for a lack of space at detention centres. Although it’s not a devolved issue I contacted the Welsh Assembly Government about the rumours. A number of assembly members campaigned against the practice when asylum seekers were held in the jail back in 2001 and 2004. WAG assured me last week that it is not happening. Read more in the current edition of Big Issue Cymru (Jan 13-20). Also, please check out if you can my friend John Gilheaney’s blog Save Llantrisant Post Office. Should commercial airlines sell seats to allow the Government to forcibly return asylum seekers? The issue’s been brewing since early last year – but it’s not one airlines themselves are particularly eager to discuss. Take the case of Veneera Aliyeva. Veneera settled so successfully in Swansea with her two children that when immigration officers came to take them away, the community campaigned for her. The campaign continues although, as I write, the family had finally been released from a detention centre by the Home Office pending a possible judicial review. The threat of expulsion from the UK still loomed over them. If they are forced to return to Azerbaijan they will do so on an airline in seats you or I’d use for our holidays. Twice the family has been marked down for return, both times on British Midland Airways (bmi) flights from Heathrow. When I contacted bmi to ask whether it would abandon these flights, it responded with classic meaningless PR. Veneera is a 40-year-old ethnic Armenian. Since a war between Azeris and Armenians in the early 1990s tensions have been high. More than 600,000 remain displaced from their homes, according to Amnesty International, despite a 1994 ceasefire. Veneera is married to an Azeri and kept her own ethnicity secret until she was seen visiting her mother’s grave in an Armenian graveyard. The harassment began and, according to Asylum Justice, she was beaten and raped. Campaigners, then, are concerned for her safety if she is made to return. So note how bmi publicly absolves itself of responsibility. It says it can’t discuss the fact that Veneera is being flown back to all possible horrors because of the awful DPA – ie, to protect her privacy as a passenger. Note also the swish of the bat which knocks the issue in the direction of the Home Office. The airline – whose subsidiary bmi baby flies out of Cardiff International – should take responsibility for its actions. If it is proud to be carrying out government policy then why not say so? Other airlines who make these flights have previously intimated that they have no choice but to do the Government’s bidding. But the Home Office says they can turn down these unwilling passengers. In fact, earlier this year XL Airways said it would no longer take part in these flights out of “sympathy for all dispossessed persons in the world”. Will we be a better country, or bmi a better company, if Veneera and her children are forced somewhere they do not want to go? Threats of terror and aggression are often more than a little convenient for some. Take the latest Iranian incident in which five speedboats are reported to have “harassed three US navy ships at the weekend”. The story comes as George Bush prepares to travel to the Middle East to condemn the “Iranian threat”. The BBC reports that official media in Iran reported the incident with some “scepticism”. Perhaps the BBC might try doing the same. Instead, it tonight highlights a White House warning to Iran against “provocative actions that could lead to a dangerous incident in the future”. He said at least some of the boats were visibly armed. Much like the US warships then, in waters thousands of miles from their home. The BBC reports that the Pentagon insisted that the three US vessels were in international waters. And the Beeb goes on: “The incident follows a row that erupted last March when Iranian Revolutionary Guards captured 15 British sailors and held them for nearly two weeks. To that it might be worth adding the following: the House of Commons’ Foreign Affairs Committee took some time investigating that incident. Martin Pratt, of the International Boundaries Research Unit, Durham University, told the committee that he believed the map published by the Ministry of Defence following the sailors’ arrest was “certainly an oversimplification of reality, and I think it could reasonably be argued that it was deliberately misleading”.